« Listen Up. Value of Exhibiting. Stop. 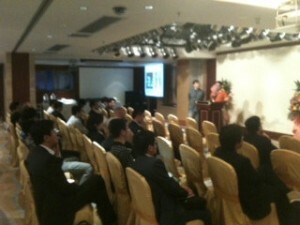 Scala held its first Asian conference Nov. 24-25 in Shenzhen China. 75 partners and end users from Japan, Hong Kong, various cities in China, Taiwan, Korea, Australia, Singapore and Malaysia were brought together by Scala to discuss the market in Asia and to share information. Scala has, we are told, seen major growth in this region, which was confirmed by the attendees. Gerard Bucas, member of Scala’s Board of Directors and former CEO, kicked things off, followed by talks by other industry experts. The event was organised by Guillaume Proux (VP Scala Asia) and sponsored by AMD, Microsoft, iBase and IAdea. This entry was posted on Monday, November 28th, 2011 at 09:00 @416 and is filed under Scuttlebut. You can follow any responses to this entry through the RSS 2.0 feed. You can leave a response, or trackback from your own site.